The smell of King Cakes is in the air. Shelves are lined with plastic beads. Everyone’s normal Purple and Gold attire now has an added Green color. Yep, Mardi Gras season is here in Baton Rouge. Baton Rouge’s first and only all-female parade, the Krewe of Artemis will roll through the streets of downtown Baton Rouge to celebrate their 14th year. The parade begins and ends on Government Street near the River Center. 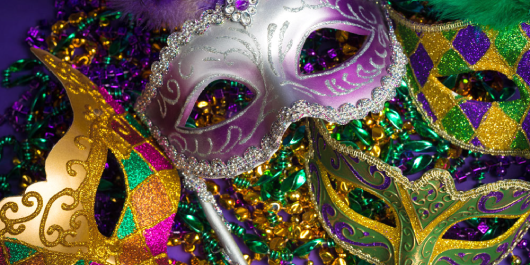 Revelers will be treated with themed throws, including the Krewe of Artemis’ signature High Heeled Shoe, along with footballs, tambourines, stuffed animals, float beads and lighted throws. Baton Rouge’s oldest parade, the Krewe Mystique de la Capitale is celebrating 40 years parading around downtown Baton Rouge. This year’s parade features new floats and more than 70 marching units. Click here to download the parade route. The Krewe of Orion will celebrate its 17th year as the premier mens’ Mardi Gras krewe in Baton Rouge. The family-friendly parade begins and ends on Government Street near the River Center and rolls through downtown Baton Rouge. This year’s theme is “Jet Set,” and more than 300 costumed riders will toss polystone beads for each float and the parade theme, Krewe of Orion footballs, Krewe of Orion cups, lighted beads, and the traditional multicolored plastic beads. This one is for the dogs, literally. The parade is the largest fund-raiser for CAAWS and raises much needed funds for the CAAWS Community Outreach Spay/Neuter Program. This is a very special parade that allows dogs and their families to be a part of a Mardi Gras fun. The parade is a walking parade where dogs and their owners stroll along North Blvd. in their finest Mardi Gras attire. Anyone can enter the parade. You only have to fill out an entry form and pay the entry fee. For more information, visit the Krewe of Mutts website. Get ready for a night under the big top when the Krewe of Southdowns rolls. The family-friendly parade starts at Glasgow Middle School in the Southdowns Neighborhood and ends near Acadian and Perkins. Click here to download the parade route. Get your Pink on with the 36th annual Spanish Town parade. The parade, which is no stranger to risqué floats and letting it all hang out, begins in front of the State Capitol and rolls throughout downtown. An alcohol-free Family Zone will be located on the North side of Convention Street between 5th and 7th streets. This much is certain when it comes to Spanish Town: Expect the unexpected.